Red Dead Online may be arriving today (at least for those who own the Ultimate Edition), but the single player portion of Red Dead Redemption 2 is still awash in secrets and Easter eggs that have yet to be uncovered by the game's giant player base. Reached the epilogue? Good. Let's talk about John Marston's skeletal face. 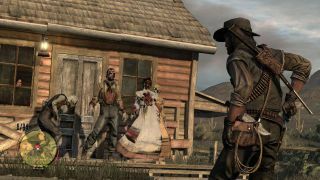 Upon jumping down a well in the Tall Trees region of the map (bordering New Austin), the character's features begin to glow in the dark, revealing his zombified alter ego that dons the cover of Red Dead Redemption's Undead Nightmare expansion. Players have discovered that the same thing happens when playing as Arthur Morgan, though it's not quite as glaring, but many have interpreted this as a tease for Red Dead Redemption 2's very own Undead Nightmare DLC. Since, by the end of the game, we're back playing as John in New Austin, the door has certainly been left open by Rockstar for a sequel to the original spin-off expansion, in which zombies infest the western frontier for a campy, horror-tinged mini campaign. If it is a bona fide portent, don't expect any news for a while. Rockstar is no doubt focusing on setting up Red Dead Online for a smooth launch right now, and the studio's previous commitments to story DLC for GTA 5 eventually turned out to be nothing more than false promises. We'll keep you posted if and when we hear anything else but, for now, this Easter egg is a creepy little nod to Red Dead Redemption's brief affair with B-movie schlock. In the meantime, check out our guide to the Red Dead Redemption 2 Legendary Animals, and catch 'em all to unlock every costume at the Trapper.